and small town populations." 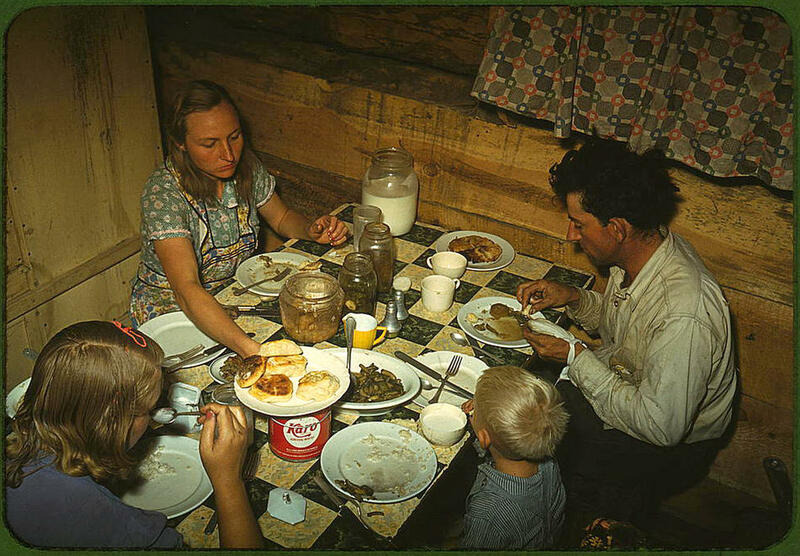 Somehow, seeing these people's lives in color makes the poverty more cruel and more relatable. Still, I'll always love this. That’s a big container of Karo on the table–I guess we forget how longstanding our national love affair with corn syrup is. As I recall, in To Kill a Mockingbird, there’s a scene where Scout is appalled to see a boy from a trashy family pouring syrup all over meat (although that might not have been corn syrup). On that table in the photo, I’m seeing Karo, biscuits, milk, and possibly home-canned veggies, as well as a plate at the end of the table that I can’t identify. There may not be any meat on the table, and there definitely is no sign of any fresh produce at all. Locavores, take note. Oh my gosh, thanks for posting this and the link. They made my day. A few in that series are by Marion Post Wolcott,and there is a great biography of her called Looking for the Light by Paul Hendrickson, about her unconventional early years, her passion for photography and the mystery of why she disappeared into marriage. The color makes this part of history feel so much more recent and relevant. Amazing. Looks like that plate on the end is a smallish pie. There might be a plate of fried meat under Mom’s right wrist. Check this out: color photos from Russia from 100 years ago. Wendy, I’ve been where #2 was taken (or very close), and it’s not so different today. The view of Tbilisi, #6, while recognizable, is quite changed. The city is built up to the first ridge in the distance, with high-rises particularly close to the outskirts. It’s too bad FDR didn’t live to see People of Walmart. My dad grew up on a farm in Iowa beginning in this era (he was born in 1940). He talks about his diet sometimes, consisting of lotsa good stuff in the summer, but lots of eggs and root veg in the winter. One of the biggest impacts for him of going off to college was the noticeable improvement in his health. He was eating in the food service at Wartburg College, where he was studying to become a minister, and the diet was just much better for him. He also got his teeth fixed during this period. His father had not believed in going to town for the dentist. I inherited some of this grandmother’s cookbooks and they are impressive for their view into life on the farm. This woman made her own soap, for crissakes. It’s hard to be too critical of someone who was trying to keep three teenage sons fed. But it’s true that these folks had something to learn about balanced diet. I was in a bar more working class than my usual haunts this weekend, and thinking about these pictures. What has changed Americans physically is the combination of (i) a lot less smoking and (ii) a lot more food. Americans today just aren’t wrinkled like the people in these pictures. I question, however, whether the average American eats a healthier diet than people 70 years ago–I think they just eat a lot more. Americans today just aren’t wrinkled like the people in these pictures. A lot less outdoor work. Then again, one reason why folks think I’m a lot younger than I am is because they’re invariably comparing me to the women of northern-European extraction who’ve been diligently baking themselves in the tanning salons since the age of thirteen or so. Come to the midwest; you can see very wrinkled thirtysomethings! Is the diet healthier than 70 years ago? Depends which group of people you’re talking about. Poor people whose ancestors had a short growing season didn’t eat a lot of non-starchy veggies (and few fresh veggies) because they didn’t have them, weren’t familiar with them, and didn’t know how to cook them. People (including poor folks) whose ancestors came from places with long growing seasons ate tons of vegetables because that’s what they had, and that’s what they were familiar with. Portion sizes have gotten a lot larger, and along with a “waste not, want not” ethic that most USians have, that can result in weight gain, but I don’t think that’s the whole story. I suspect endocrine disruptors from environmental pollution are playing a big part in weight gain in the same way DDT was making birds disappear back in the 60s. I have devoted a great deal of effort to finding a hat that is good for the sun and doesn’t make me look stupid if I were to wear it around town (as opposed to puttering in the yard or playing ball). I failed to find anything, so I think next summer I’m going to cave on the “doesn’t make me look stupid” criteria.